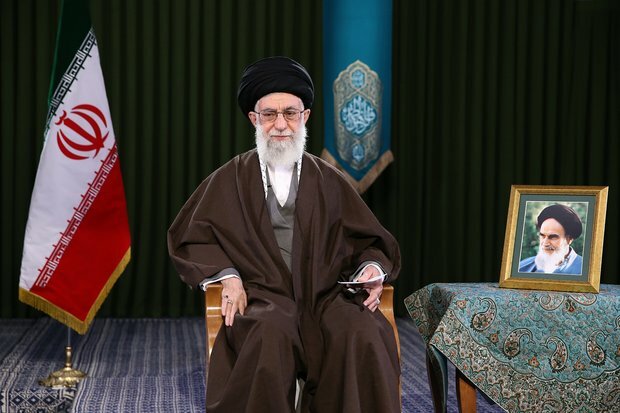 Leader of the Islamic Revolution Ayatollah Seyyed Ali Khamenei says “boosting domestic production” is the pivotal issue of the Persian New Year. In a message released shortly after the start of the New Year, the Leader called on all officials to put more efforts into the issue. Transform our condition to the best of conditions! I thank God for ordaining that I may congratulate the dear Iranian nation on this year’s Nowruz, which coincides with the auspicious birth anniversary of the Commander of the Faithful and Imam of the Pious (a.s.). Dear compatriots, may this eid be an auspicious one for you. I hope that all of you will pass this year with happiness, with physical health, with joyful hearts and with increasing worldly and spiritual achievements, God willing. I especially wish to congratulate the esteemed families of the martyrs, the dear disabled war veterans and their families. And I would like to send abundant greetings to the immaculate soul of our magnanimous Imam [Khomeini] and to the pure souls of the martyrs. We experienced an eventful year. In the year that passed, the Iranian nation shone brightly in the true sense of the word. The enemies devised many plans. They had many plots for the Iranian nation. However, the solidity and insight of the nation and the determination of the youth foiled their plans. In the face of the harsh and – according to their own words – ‘unprecedented’ sanctions imposed by the United States and Europe, the Iranian nation gave a solid and powerful response both in the arena of politics and in the arena of the economy. In the arena of politics, the manifestation of that response was the great 22nd of Bahman rally [February 11] and the people’s positions throughout the year. As for the people’s position in the economic confrontation, it was manifested through an increase in scientific and technical innovations, a substantial increase in the number of knowledge-based companies and an increase in infrastructural and fundamental products of the country, an example of which is the inauguration of different phases of the South Pars gas field just a few days ago and before that, the inauguration of the large Bandar Abbas Refinery and other such tasks. Therefore, the people managed to show their power, their grandeur and their greatness in the face of the enmity and malevolence of the enemies and thereby – thank God – increase the reputation of our nation, our Revolution and our Islamic Republic. The main problem of the country continues to be economic problems. Especially in recent months, people’s livelihood problems have increased. Part of these problems is related to inefficient management in the area of economic matters, which should definitely be compensated for. Certain plans and measures have been devised. By Allah’s favor, these measures should be implemented throughout this year – the year that begins from this moment: the year 1398 – and the people should feel the impact. What I would like to mention in this regard is that the country’s urgent and serious matter and its priority in the present time is the issue of the economy. Regarding the economy, the issues that we have are many: the issue of the decrease in the value of the national currency is an important matter. The same is true of people’s purchasing power. The same condition exists regarding factories, their lowered capacity and the closing down of some of them. These are the problems. Based on research and having benefitted from the viewpoints of experts, one concludes that the key to all these problems is the expansion of national production. I named the year 1397, “The Year of Support for Iranian Products”. I cannot say that this slogan was fully implemented, but what I can say is that it was well received to a great extent, and in many cases, the people welcomed and acted on it. This will certainly exert its influence. This year, the issue of production is of great importance. I would like to make the issue of production the pivot of our activities. By Allah’s favor, in my new year’s speech, I will explain what I mean by ‘production’. If production is boosted, it can solve livelihood problems, it can ensure the country’s independence from foreigners and from the enemies, it can eliminate unemployment and it can solve the problems related to the decrease in the value of the national currency to a great extent. That is why I believe that the issue of production is a pivotal issue this year. Therefore, the slogan I have chosen for this year is: “The Year of Boosting Production”. Everyone should try to do what they can to boost production in the country. By Allah’s favor, from the beginning to the end of the year, this notion should be completely tangible in the country. If this happens, we hope that the solution to economic problems will be achieved, God willing. I wish to send my heartfelt peace and greetings to the Imam of the Time (may our souls be sacrificed for his sake). I plead for the prayers of that noble personality for you dear people and I ask Allah the Exalted to bestow happiness and bliss on the Iranian nation and all those nations who celebrate Nowruz. Greetings be upon you and Allah’s mercy and blessings!